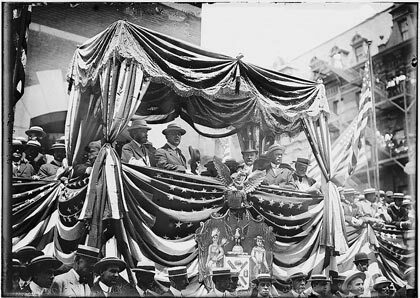 July 4 ,1911– Mayor Jonah Woolsey (second from left) addresses a large crowd gathered at Main Avenue and Baylor (now Third) Street, during three hours of speeches in celebration of the holiday. Later that evening, stray sparks from fireworks at Memorial Park would light several piles of unused bunting afire next to the Geo. Hardlin and Sons lumberyard, thus setting off what became known as the Great Downtown Fire of 1911. The fire raged for twelve hours, spanning thirty blocks and burning over six hundred buildings. Amazingly, only two people lost their lives. The following year, the fireworks were moved to the City’s new fairgrounds, two miles outside of town.